» home » enterprise zones » » retrofitting a press with a servo transfer? Rod Naseman is product manager for press automation at Wayne Trail−A Lincoln Electric Company, Fort Loramie, OH; 937/295-2120; http://www.waynetrail.com. Transferring stamped or formed parts from station to station inside of a stamping press is not a new concept, but the options available, front-and-back or through-the-window, and just what they can accomplish, may offer some new news to metalformers. With these options, retrofits are a viable alternative to new-press purchases. Today’s transfer systems employ servo technology, providing the flexibility to move parts through a press that employs virtually any crank motion. Typical standard eccentric and link-motion presses have been in operation for years. With a feedback device coupled to the crankshaft, the transfer can be programmed to follow the motion of the crank through the direct-coupled feedback device. In link-motion presses, the transfer programming is modified to allow for slow down and speed up of the crank through the press stroke. The modules in a front-and-back servo-driven transfer system occupy less real estate than with an upright or through-the-window system. Front-and-back transfers are positioned in front of or behind the die so that the module can be run and parked in a full-up position for die access. However, when additional access is needed, longer transfer-mounting frames can be supplied, allowing the transfer module to be shifted laterally away from the press bed and parked in the offline position. Modularly designed, full-servo transfer technology can turn a new or under-utilized stamping press into a valuable, multipurpose metalforming resource. Choosing to place the servo transfer online or offline allows the same press to be used not only for new transfer operations, but also for blanking or progressive-die work. With servo-press technology becoming more popular, the need to work more closely with press manufacturers becomes more of a necessity so that motion produced by the servo press (i.e., pendulum, rapid restrike, variable link motion, etc.) can be accurately followed with the transfer. This can be accomplished in a variety of ways, depending on the control scheme of the press and transfer. If both systems employ the same control architecture, all of the axes will operate in harmony via the same feedback device. If the architecture differs, the virtual axes of the press and transfer must be electronically geared through proportional-integral-derivative (PID) controller loop timing. In contrast, if the press cannot provide a virtual feedback, the transfer must follow the press via a series of gearing/ungearing sequences to avoid points of discontinuity in the profile. This type of control is not desirable—a means for virtual-axis feedback is preferred. Before deciding on the type of servo technology needed, start by understanding each system’s capabilities and limitations. What is your best choice, a front-and-back-mounted system or a through-the-window-style transfer? A through-the-window transfer system often requires transfer hardware to be mounted on each end of the press. This solution can cause trouble for stampers using progressive dies, particularly because their presses have press feeds positioned at the press, which would interfere with the transfer mounting, transfer bars and tools used to move parts. A through-the-window servo-driven transfer system often requires transfer hardware to be mounted on each end of the press, which may prove challenging when working with progressive dies. But such a system is ideal if frequent access to the die is required. Transfer-drive mechanisms on both ends and the ability to uncouple the tooling bar ease access. 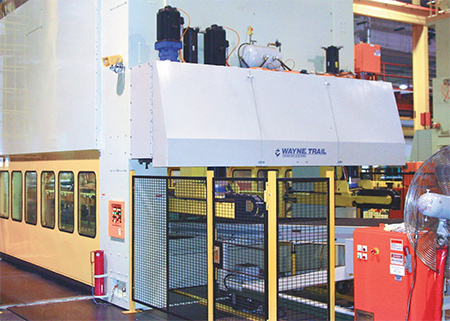 To use a through-the-window transfer, the stamper would have to relocate the press feed, which increases the production footprint and could disrupt production workflow. Here, front-and-back transfers are a better solution—the module placement would not interfere with the press feed, keeping the current press-feed line intact. Another factor: Based on the type of application, coil width can directly impact which servo-transfer solution to employ. With a front-and-back transfer, the modules take up far less real estate than an upright or through-the-window transfer. 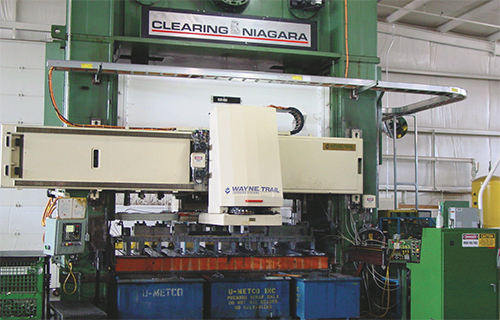 The tooling bar travels the length of the through-the-window press with the size of the tooling bar often dictated by the left-to-right dimension of the press, with a longer length requiring a larger tooling bar. This leaves reduced space for coil width. A lack of proper coil-width space reduces the range of automation capabilities on a press. While both systems allow die access, a through-the-window transfer system is ideal if frequent access to the die is required. Transfer-drive mechanisms on both ends and the ability to uncouple the tooling bar ease access. Front-and-back transfers are positioned in front of or behind the die so that the module can be run and parked in a full-up position for die access. However, when additional access is needed, longer transfer-mounting frames can be supplied, allowing the transfer module to be shifted laterally away from the press bed and parked in the offline position. Full-servo through-the-window and modular front-and-back systems can provide stampers with the flexibility to address future production needs. Dual-lane production for each system eliminates the need for a second press and utilizes a smaller, more efficient footprint, which can double production output. The full-servo drive system allows for independent control of each axis, production of parts from the right or left side, and the ability to incorporate special tooling orientations or techniques. Incorporating a U-turn configuration in the die line—possible in either type of system—also can eliminate the need for a second press. A U-turn arrangement allows for finger grips to transfer the part from station to station, and when a part reaches the end of the first production die line, the part is shifted 90 deg. and is transferred to the second production die line, which runs alongside the first. Since each tooling bar operates independently on the X axis, transfer bars move in opposite directions simultaneously, thus optimizing press loading and throughput.